Jack was born October 24, 1934 in Verdel, Nebraska and passed away November 28, 2018 in Dallas, Texas. Jack was preceded in death by his mother Ruth Starkey, father John C. McColley, first wife Virginia (Allison) McColley, second wife Mary (Gorrell) McColley, younger brother Gary McColley and daughter Jenny Lee Stoddard. Jack is survived by his wife Geneva McColley, son John McColley and wife Kathy, step-son Dale Batey and wife Linda, grandchildren Angie Tate and husband Joshua, Paul McColley, Angel Rogers and husband Louis and Krista Manske and husband Douglas, and great grandchildren Luke Wygren, Kathryn Tate, Noah Rogers and Jonathan Tate as well as extended family and friends. Jack, a graduate of Sherman High School, spent almost his entire life working in the grocery industry. Starting at A&P Food Stores in Sherman, Texas he was transferred to Jacksonville, Texas, back to Sherman, then to Mesquite and later to New Orleans, Louisiana and then Baton Rouge, Louisiana. Leaving A&P after more than 30 years Jack and Virginia returned to Mesquite where he worked more than 20 years for several independent grocers in Dallas, Richardson, Midolothian, Red Oak and Ferris. Jack was a Chrisitian. The frequent requirement of his job to work Sunday and Wednesday was a test of his faith which only made it stronger. Jack led his family in a Christian manner and lived a life treating everyone he met with dignity and grace. Like his father before him, Jack was an ardent Dallas Cowboys fan. He went to a few games at the Cotton Bowl in Fair Park, a few more in Texas Stadium and was pleased to attend one game at AT&T stadium courtesy of his niece Jackie Tucker and her husband Bill. And of course, Jack always had time for ice cream. Two scoops. Jack was married to Virginia from November 21, 1952 to April 26, 2002, to Mary from August 22, 2003 to February 5, 2011 and Geneva from October 20, 2012 to his passing. 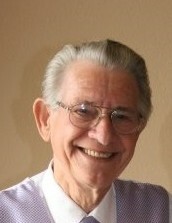 Jack was currently a resident of Red Oak, Texas.